Roller Shades for Windows are an ideal covering for any room in your home. One of the best books I have seen about the use of roller shades in window treatments is "The Shade Book". This book features beautiful and functional shades, blinds, swags, and valances. This home decoration guide provides an in-depth look at a wide variety of non drapery window coverings, including roller shades for windows. Instructions for creating and installing many styles of shades are provided with both the beginner and the expert do-it-yourself homemaker in mind. Included are tips for creating countless variations on classic styles, including roman shades, cloud shades, balloon shades, Austrian shades and shade toppers. The environmental advantages of shades are also stressed, with detailed information on each shade's ability to conserve energy by holding heat during the winter while reflecting the sun in the summer. Tips on care and upkeep, plus yardage charts complete the book. What makes the roller blind the most popular window blind around today? Is it because they are the best value for the money window treatment or is there anything else in it. There is not doubt they do provide a cheap and efficient way of blocking out the light and the heat that comes with the light. Also the glare can spoil the enjoyment of that room, particularly a TV or computer room, and the damage to valuable furniture and your favorite plants. The operation of roller blinds is simple, especially compared to Venetian blinds or roman blinds. The blinds can be rolled up or down depending on how much light is needed at any one time. They are best mounted inside the window recess and can be effectively teamed up with curtains, drapes or valances to add that extra bit to the room's decor. They are very flexible and can be used in any room of your house as well as in the conservatory. They are ideal for windows where the depth is narrow and are also the perfect way to cover storage areas. They are very easy to adjust. Roller blinds with special reflective aluminum backing are the most popular for conservatory blinds in the UK. The sunlight in effect bounces off the back of these blinds providing effective heat protection and glare control. This means you have an effective protection for valuable furniture and plants, particularly in the conservatory. What criteria should be taken into account when selecting roller blinds? Well, the most crucial factor in selecting a roller blind is choosing the right material. Most roller blinds are crafted from relatively translucent fabrics, so that the light entering the room is not completely blocked and some light manages to filter through giving a pleasing subdued light. If this is not enough, and complete black out is needed, for say small children or developing photographs, then blackout blinds are also available. These, as you would expect, block out the light completely. They are also effective in keeping the room cool in the summers and warm in the winters. Also, the room the blinds are needed for is important. Kitchens and bathrooms require much more robust fabrics which are very colorful. In general, the blind should be closely woven and lightweight. Roller blinds come in a huge selection of colors and in many different styles. Another great thing about roller blinds is that they are quite easy to maintain. 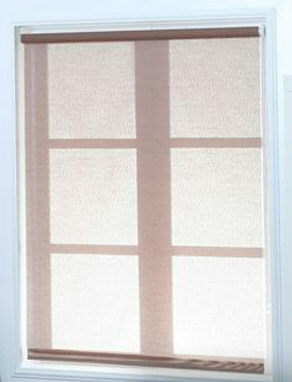 The blinds are constructed of fabric that is hard wearing and will only require a simple wipe with a damp cloth. Installation of roller shades for windows is relatively simple - certainly easier than other types of blinds. Almost anyone can fit these with ease and in no time at all. As mentioned previously, Roller blinds are versatile with plenty of decorative possibilities, and while they may lack the attractiveness of pinoleum or pleated blinds, they are an immensely practical solution. They are a great value for the money and are usually priced at the lower end of the budget range. Thus, they are an affordable and practical solution for low-budget window treatments. Thanks Garry for the information about roller shades for windows.